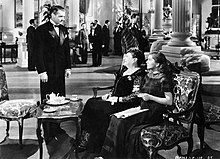 In Monte Carlo, Max de Winter (Laurence Olivier) stops to speak to Mrs. Edythe Van Hopper (Florence Bates) only after recognizing her companion (Joan Fontaine), the girl he had encountered earlier. An inexperienced young woman (Joan Fontaine) meets aristocratic widower Maxim de Winter (Laurence Olivier), and soon becomes the second Mrs. de Winter. Maxim takes his new bride back to his grand mansion by the sea, dominated by its housekeeper Mrs. Danvers (Judith Anderson), a chilly individual who had been a close confidante of the first Mrs. De Winter - Rebecca - with whom she is clearly still obsessed. She has even preserved Rebecca’s bedroom suite unchanged, and continues to display various items that carry her monogram. Eventually her constant reminders of Rebecca’s glamour and sophistication convince the new Mrs. de Winter that Maxim is still in love with his first wife, and that this could explain his irrational outbursts of anger. She tries to please her husband by holding a costume party, as he and Rebecca used to. Danvers advises her to copy the dress that one of Maxim’s ancestors is seen wearing in a portrait. But when she appears in the costume, Maxim is appalled; Rebecca had worn an identical dress at her last ball, just before her death. Mrs. de Winter confronts Danvers about this, but Danvers tells her she can never take Rebecca's place, and almost persuades her to jump to her death. At that moment, however, the alarm is raised because a sunken boat has been found with Rebecca's body in it. Maxim now confesses to his wife that his first marriage had been a sham from the start, when Rebecca had declared that she had no intention of keeping to her vows, but would just pretend to be the perfect wife and hostess for the sake of appearances. When she claimed she was pregnant by another man, she taunted him that the estate might pass to someone not of Maxim’s line. During a heated argument, she fell, struck her head and died. To conceal the truth, Maxim took the body out in a boat, which he then scuttled, and identified another body as Rebecca’s. The sudden crisis causes the second Mrs. de Winter to shed her naive ways, as they plan how to prove Maxim’s innocence. When the police say it looks like suicide, Rebecca’s lover threatens to reveal that she had never been suicidal, unless Maxim pays blackmail. When Maxim goes to the police, they suspect him of murder, but investigation shows that she was not pregnant, but close to death from cancer, so the suicide verdict stands. In fact, Rebecca had been trying to goad Maxim into killing her - indirect suicide - so that Maxim would have been ruined, possibly hanged. A free man, Maxim returns home to see the great house on fire, set ablaze by the deranged Mrs. Danvers. All escape except Danvers, when the ceiling collapses on her. The film ends with an R-monogrammed nightdress-case consumed by flames. Hitchcock's cameo appearance, a signature feature of his films, takes place near the end; he is seen walking, back turned to the audience, outside a phone box just after Jack Favell completes a call. Laurence Olivier and Joan Fontaine, stars of the film. At Selznick's insistence, the film faithfully adapts the plot of du Maurier's novel Rebecca. However, at least one plot detail was altered to comply with the Hollywood Production Code, which said that the murder of a spouse had to be punished. In the novel, Maxim shoots Rebecca, while in the film, he only thinks of killing her as she taunted him into believing that she was pregnant with another man's child, and her subsequent death is accidental. However, Rebecca was not pregnant but had incurable cancer and had a motive to commit suicide, that of punishing Maxim from beyond the grave. Therefore, her death is declared a suicide, not murder. 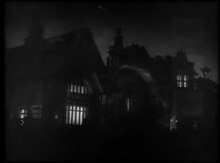 Hitchcock later said that Selznick wanted the smoke from the burning Manderley to spell out a huge "R", which Hitchcock thought lacked subtlety. While Selznick was preoccupied by Gone with the Wind (1939), Hitchcock was able to replace the smoky "R" with the burning of a monogrammed négligée case lying atop a bed pillow. Hitchcock edited the film "in camera" (shooting only what he wanted to see in the final film) to restrict the producer's power to re-edit the picture. But Selznick relished the post-production process; he personally edited the footage, laid in Franz Waxman's score, and supervised retakes and extensive re-recording of the dialogue of Sanders, Bates and Fontaine. Rewrites and reshooting were called for after a rough cut was previewed on December 26, 1939. Although Selznick insisted that the film be faithful to the novel, Hitchcock did make some other changes, though not as many as he had made in a previously rejected screenplay, in which he altered virtually the entire story. In the novel, Mrs. Danvers is something of a jealous mother figure, and her past is mentioned in the book. But in the film, Mrs. Danvers is a much younger character (Judith Anderson would have been about 42 at the time of shooting), and her past is not revealed at all. The only thing we know about her is that she came to Manderley when Rebecca was a bride. The Breen Office, Hollywood's censorship board, specifically prohibited any outright hint of a lesbian infatuation or relationship between Mrs. Danvers and Rebecca,:70 though the film clearly does dwell on Danvers' obsessive memories of her late mistress. The Hollywood Reporter reported in 1944 that Edwina Levin MacDonald sued Selznick, Daphne du Maurier, United Artists and Doubleday for plagiarism. MacDonald claimed that the film Rebecca was stolen from her novel Blind Windows, and sought an undisclosed amount of accounting and damages. The complaint was dismissed on January 14, 1948 and the judgment can be read online. Frank S. Nugent of The New York Times called it "an altogether brilliant film, haunting, suspenseful, handsome and handsomely played." Variety called it "an artistic success" but warned it was "too tragic and deeply psychological to hit the fancy of wide audience appeal." Film Daily wrote: "Here is a picture that has the mark of quality in every department - production, direction, acting, writing and photography - and should have special appeal to femme fans. It creates a new star in Joan Fontaine, who does fine work in a difficult role, while Laurence Olivier is splendid." Harrison's Reports declared: "A powerful psychological drama for adults. David O. Selznick has given it a superb production, and Alfred Hitchcock has again displayed his directorial skill in building up situations that thrill and hold the spectator in tense suspense." John Mosher of The New Yorker wrote that Hitchcock "labored hard to capture every tragic or ominous nuance, and presents a romance which is, I think, even more stirring than the novel." The film currently holds a 100% approval rating on Rotten Tomatoes. Rebecca won the Film Daily year-end poll of 546 critics nationwide naming the best films of 1940. Rebecca was the opening film at the 1st Berlin International Film Festival in 1951. In 2018, the film was selected for preservation in the United States National Film Registry by the Library of Congress as being "culturally, historically, or aesthetically significant." The film earned $2 million in the US and $1 million in Britain on its initial release. It was re-released in Britain in 1945 and made $460,000. Rebecca won two Academy Awards and was nominated for nine more: It is the only film since 1936 (when awards for actors in supporting roles were first introduced) that, despite winning Best Picture, received no Academy Award for acting, directing or writing. The Hollywood screen version of Rebecca was adapted for radio on numerous occasions. The Screen Guild Theater presented half-hour adaptions with Joan Fontaine, her husband at the time, Brian Aherne, and Agnes Moorehead (May 31, 1943), and with Loretta Young, John Lund and Agnes Moorehead (November 18, 1948). Joan Fontaine and Joseph Cotten performed a half-hour adaptation October 1, 1946, on The Cresta Blanca Hollywood Players. The Lux Radio Theatre presented hour-long adaptations with Ronald Colman, Ida Lupino and Judith Anderson (February 3, 1941), and with Laurence Olivier, Vivien Leigh and Betty Blythe (November 6, 1950). A Broadway stage adaptation starring Diana Barrymore, Bramwell Fletcher and Florence Reed ran January 18 – February 3, 1945, at the Ethel Barrymore Theatre. On television, Rebecca was adapted for The Philco Television Playhouse (October 10, 1948), with Mary Anderson and Bramwell Fletcher; Robert Montgomery Presents (May 22, 1950), with Barbara Bel Geddes and Peter Cookson; and Broadway Television Theatre (September 1, 1952), with Patricia Breslin and Scott Forbes. Theatre '62 presented an NBC-TV adaptation starring James Mason as Maxim, Joan Hackett as the second Mrs. de Winter, and Nina Foch as Mrs. Danvers. The movie was an inspiration for the Kollywood movie Puthiya Paravai starring Sivaji Ganesan. The film has been remade by Bollywood twice—as Kohra (1964), starring Waheeda Rehman and Biswajit Chatterjee; and as Anamika (2008), starring Dino Morea, Minissha Lamba and Koena Mitra. Rebecca was adapted as a 1979 BBC Television drama series directed by Simon Langton. It starred Jeremy Brett, Joanna David and Anna Massey. Four 55-minute episodes were produced and aired on BBC 1. Rebecca was adapted as a 1997 British/German television serial directed by Jim O'Brien. The script by Arthur Hopcraft is based on the novel. It starred Charles Dance, Emilia Fox and Diana Rigg. It was broadcast on the ITV network. In 2018, it was reported that Netflix would be creating a new remake of the film, which would be directed by Ben Wheatley, and written by Jane Goldman. Lily James and Armie Hammer are set to star. The film Rebecca was parodied on The Carol Burnett Show in a 1972 skit called "Rebecky". The Comic Strip Presents episode 'Consuela' was a French and Saunders-led pastiche of Hitchcock's 'Rebecca', with French's eponymous crazed housekeeper taking centre stage. The film was used as the basis of a sketch on the BBC comedy sketch show That Mitchell and Webb Look. In the skit, the plot is changed, at the insistence of the producer, to a prequel, set while the first Mrs. de Winter is still alive and has just begun living with Maxim. The humour is derived from references to the then-unknown second Mrs. de Winter scattered throughout the mansion, such as a dress "reserved for the second Mrs. de Winter" and a painting of a woman with her face covered and the letters "TBA" written. ^ a b Box Office Information for Rebecca. The Numbers. Retrieved January 30, 2013. ^ a b Spoto, Donald (1999). The Dark Side of Genius: The Life of Alfred Hitchcock. Da Capo Press. pp. 213–214. ISBN 978-0-306-80932-3. ^ Chandler, Charlotte (2005). It's Only a Movie: Alfred Hitchcock, A Personal Biography. New York: Simon & Schuster. p. 129. ^ Leff, Leonard J. (1987). Hitchcock and Selznick: The Rich and Strange Collaboration of Alfred Hitchcock and David O. Selznick in Hollywood. New York: Weidenfeld & Nicolson. pp. 78–80. ISBN 1-55584-057-4. ^ Leff, Leonard J. (1987). Hitchcock and Selznick: The Rich and Strange Collaboration of Alfred Hitchcock and David O. Selznick in Hollywood. New York: Weidenfeld & Nicolson. ISBN 1-55584-057-4. ^ "MacDONALD v. DU MAURIER". leagle.com. Retrieved April 19, 2016. ^ Nugent, Frank (March 29, 1940). "Movie Review - Rebecca". The New York Times. Retrieved November 28, 2015. ^ "Rebecca". Variety. New York: Variety, Inc. March 27, 1940. p. 17. ^ "Reviews". Film Daily. New York: Wid's Films and Film Folk, Inc.: 6 March 26, 1940. ^ "'Rebecca' with Laurence Olivier and Joan Fontaine". Harrison's Reports: 54. April 6, 1940. ^ Mosher, John (March 29, 1940). "The Current Cinema". The New Yorker. New York: F-R Publishing Corp. p. 71. ^ "'Rebecca' Wins Critics' Poll". Film Daily. New York: Wid's Films and Film Folk, Inc.: 1 January 14, 1941. ^ "1st Berlin International Film Festival". Berlin International Film Festival. ^ BY WAY OF REPORT: Presented by the Royal Air Force By A.H. WEILER. New York Times (1923-Current file) [New York, N.Y] March 3, 1946: X3. ^ "The 13th Academy Awards (1941) Nominees and Winners". Academy of Motion Picture Arts and Sciences. Retrieved June 19, 2013. ^ "Critic's Pick: Rebecca". The New York Times. Retrieved December 13, 2008. ^ "Screen Guild Theater". Internet Archive. Retrieved October 14, 2015. ^ "The Screen Guild Radio Programs". Digital Deli Too. Retrieved June 30, 2015. ^ "Cresta Blanca Hollywood Players". RadioGOLDINdex. Retrieved November 7, 2015. ^ "The Lux Radio Theatre". RadioGOLDINdex. Retrieved October 14, 2015. ^ "Lux Radio Theatre 1950". Internet Archive. Retrieved October 14, 2015. ^ "Rebecca". Internet Broadway Database. Retrieved October 14, 2015. ^ "Philco Television Playhouse". Classic Television Archive. Retrieved October 14, 2015. ^ "Robert Montgomery Presents". Classic Television Archive. Retrieved October 14, 2015. ^ "Broadway Television Theatre". Classic Television Archive. Retrieved October 14, 2015. ^ Rebecca (1962) (TV), Internet Movie Database. Retrieved October 8, 2013. ^ Kroll, Justin; Kroll, Justin (2018-11-14). "Lily James, Armie Hammer to Star in Daphne du Maurier Adaptation 'Rebecca'". Variety. Retrieved 2018-12-06. ^ The Carol Burnett Show: Episode No. 6.3 (27 September 1972), Internet Movie Database. Retrieved October 8, 2013. Wikimedia Commons has media related to Rebecca (film).